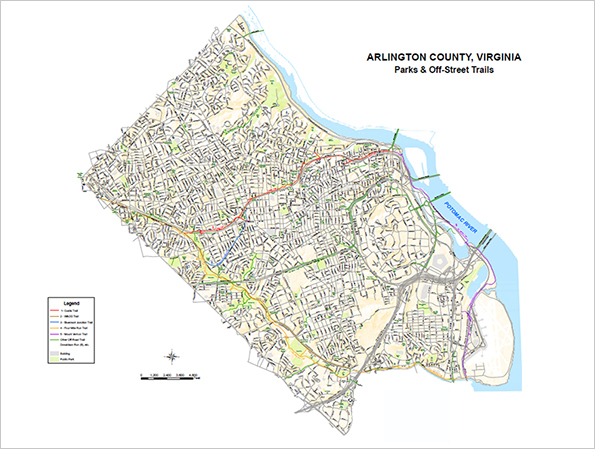 Arlington County loves its trails. We have nearly 49 miles of paved multi-use trails and additional hiking trails to explore. View additional information on bike routes. Address: 747 N. Emerson St. Trail Access: The trail can be accessed from Bluemont Park, where parking is available. Description: The Bluemont Junction Trail is a rail-trail that was constructed along a former branch of the defunct Washington & Old Dominion Railroad. 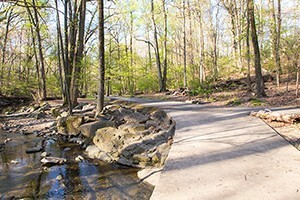 The trail travels through Bluemont Junction Park connecting Ballston with the W&OD and Four Mile Run Trails. It serves as a connection to south Arlington. Parking is available at Bluemont Park. Description: The Custis Trail is a hilly paved trail that extends from the Mount Vernon Trail in Rosslyn to the W&OD Trail near Falls Church. Stop at Ballston along the way for shops and restaurants, or visit several nearby parks including: Gateway, Thrifton, Hayes, Cherry Valley, Oakgrove, Woodlawn, Lacey woods, Bon Air and Westover. The Custis Trail is easily accessed by Metro. Alternatively, park at Bon Air or Westover Park and enjoy the trail. Description: There’s more to enjoy here than just classes at the community center. 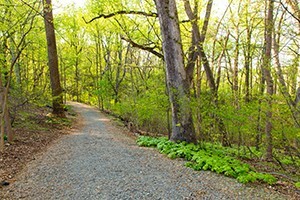 The Palisades Trail situated on 11 acres behind the main facility, provides a relaxing walk in the forest featuring ancient tulip poplar trees and views of the Potomac. Enjoy this nature trail at the former civil war site of Fort Bennet and also discover an old covered spring house. Description: Features a forested area and rocky stream that runs down to the Potomac River & Potomac Heritage Trail. There are several areas where you will have to cross the stream. If you walk far enough, you'll find the remnants of an abandoned swimming resort. Extend your hike by visiting adjacent Potomac Overlook Park or cross Military Rd. to enter Zachary Taylor Park. Address: 2411 24th Street N.
Description: This trail includes a lush tree canopy, a large meadow with native flowers, and the lovely Hendry House. There are preserved earthworks of the Civil War fort built in 1863. The trail meanders through the 19 acre site. The trail surface is variable and is asphalt, concrete & gravel. Enjoy historic features outlined on interpretive signage throughout the grounds. Take a walking tour of Fort C.F. Smith Park. 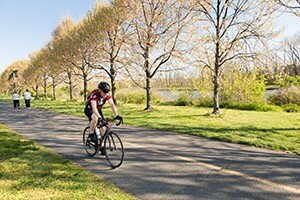 Description: A paved bike trail that runs along Four Mile Run stream from Falls Church to the Mount Vernon Trail near Ronald Reagan Washington National Airport. It connects to Bluemont Junction, W&OD and Lucky Run Trials. Bring the kids and stop at Bon Air, Bluemont, Glencarlyn, Barcroft, or Jennie Dean Park for a playground and picnic along the way. Long Branch Nature Center can also be accessed from Glencarlyn Park. Parking is available at each of the parks listed. Description: This beautiful and secluded 95.5 acre park offers a whole host of family activities. Trails throughout this park offer a beautiful setting for bird watching and other outdoor activities. There are sightings of everything from woodpeckers to wood ducks and warblers. The trails connect to Four Mile Run Trail, W&OD Trail, and Tyrol Hills Park. Description: To the east of Military road, this trail features a forested area and rocky stream that runs down to the Potomac River and Potomac Heritage National Scenic Trail. There are several areas where you will have to cross the stream. 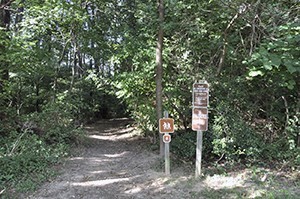 On the west side of Military road, you will find hilly, wooded trails around Gulf Branch Nature Center. Visit the log house and blacksmith shop while you are there. Meander upstream and connect to Ft Ethan Allen and Glebe Park. Address: 1200 N George Mason Dr. Description: Trails through Lacey Woods offer a small escape from an urban environment. You will find mature trees, an azalea garden, and an active group controlling invasive plant species. You may even come across red salamanders who make their home among the logs here. Access to the Custis Trail is a short trip down the street. Enjoy the playground, or play a game of basketball while you are there. You may also reserve our fire ring or picnic shelter for special events. Address: N. Columbus & 2nd Street N.
Description: This park features paved and unpaved trails along the stream through a wooded setting. 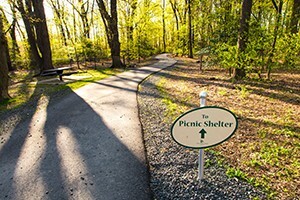 There is also a picnic shelter, charcoal grills, public restrooms, a drinking fountain, and a playground available. Enjoy a summer performance at the amphitheater. Visit adjacent Edison Park up the hill to the west or Lubber Run Community Center to the East. Parking is available at the Community Center or Amphitheater entrance. Address: Between Rosslyn and George Washington's home at Mount Vernon. Description: Beginning in Rosslyn, this is a great multi-use recreation trail. Enjoy nearly 18 miles of beautiful views along the Mount Vernon Trail. It follows the Potomac's shoreline from Theodore Roosevelt Island (near Rossyln, Va) to George Washington's Estate located at Mount Vernon. Description: Enjoy a quiet walk in the park connecting Yorktown Blvd, and Little Falls Road at George Mason Drive. Bridges cross the wooded stream at several locations and bring you closer to nature. Local gardeners have made enhancements here, and several volunteers including students from Nottingham School help to preserve the natural beauty. Enjoy this pleasant two acre park. Address: 2814 23rd Street N.
Description: Hop off the Custis Trail or swing by when you visit Lyon Village Shopping Center and visit Thrifton Hills Park. The trail offers a pleasant walk through woods and open spaces perfect for taking a break. This passive park features a paved path and natural trail. Description: East Falls Church Metro and the W&OD trail are a short distance away. The trail provides a refreshing and informative walk as you read the interpretive panels about nature. You will enjoy the wetland garden, forest, playground, and picnic area. Say hi to our volunteers at this location who are working hard to help the native plants grow. Address: Alongside Interstate 66 in Arlington. Description: The 100-foot-wide W&OD has been called "the skinniest park in Virginia." But it is also one of the longest parks, 45 miles of paved trail for walking, running, bicycling and skating. 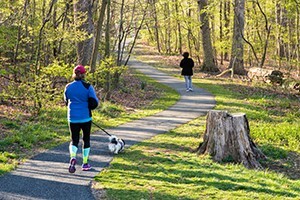 Built on the roadbed of the former Washington & Old Dominion Railroad, the multi-use W&OD Trail runs through the urban heartland and countryside of Northern Virginia from Shirlington to Purcellville. Managed by Northern Virginia Regional Park Authority (now called NOVA Parks). In the Arlington section, the W&OD Trail intersects with the Custis, and Bluemont Junction Trails. It runs parallel to the Four Mile Run Trail. Madison Manor, Benjamin Banneker, Bon Air, Bluemont, Glencarlyn, Barcroft, and Jennie Dean Park are nearby. Parking is available at each of the parks listed. Description: Enjoy this secluded natural setting between Lorcom Lane & the GW Parkway. This trail features a forested area and rocky stream that runs down to the Potomac River & Potomac Heritage Trail. There are several areas where you will have to cross the stream. For you hiking pros, there is a waterfall that can be seen from the Potomac Heritage National Scenic Trail. Parking is available at Woodmont Center, and at the end of Kenmore Street. Description: You can take this trail all the way from Marymount University at 26th Street to Military Rd. Enjoy the trail along the rehabilitated stream bed. Observe how Arlington’s first urban stream restoration accommodates storm water and provides a place for wildlife. The 44-acre park is a beautiful place to be outside with nature. Extend your hike by crossing Military Rd. and visit the trail through Donaldson Run Park.